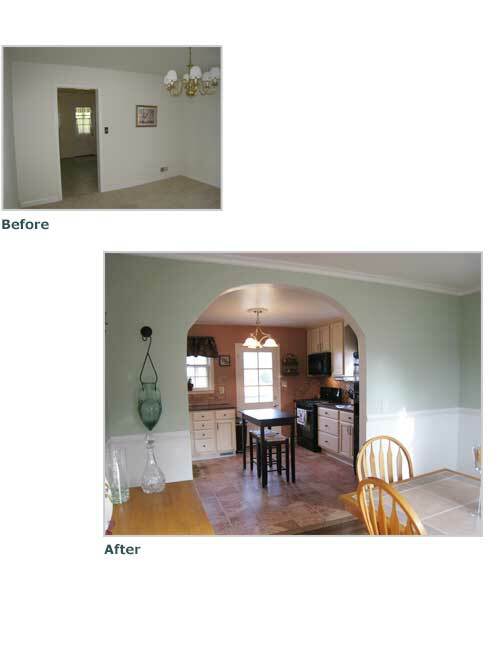 My clients bought a charming Cape Cod in Timonium which had the original 1950's kitchen. This room was going to be the very first renovation tackled after they moved in. With their own contractor in hand, we all met at the same time to review what could and couldn’t be moved, such as plumbing, venting, etc., in order to keep the contractor's fee as low as possible. With his guidance, we knew exactly how wide we could make the new archway from the dining room to the kitchen and whether we could move the sink or the stove to another wall. I then set forth to create plans for the new kitchen based on my clients' desires. I presented three and one was the overwhelming favorite choice. My clients took the rest from there, picking out everything for the kitchen. Cabinets, appliances, flooring, fixtures and more. They did a fabulous job as you will see! I was brought in for a final wall color approval sign-off and the kitchen was done. What a transformation!